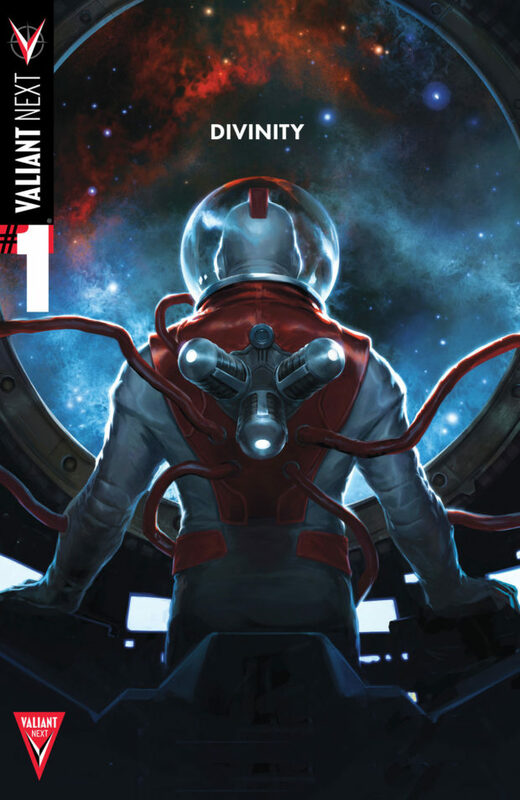 Graphic Novel Review 49/365: Divinity – Valiant Comics Week! New theme this week: Valiant Comics! When people sit around and discuss comics, we usually hear Marvel and DC titles tossed around. When people think about superheroes, they tend to pull their ladles from those two big pots. But if you are a true fan of comics, you know about Valiant. You know about the stories and heroes that have spawned from this cool company. If you are a novice to Valiant stories, you should really tune in to my blog this week. Join me and a couple of special guest reviewers as we give you a full week of Valiant Comics that you should be reading. Today, I will start the party with one of my faves. 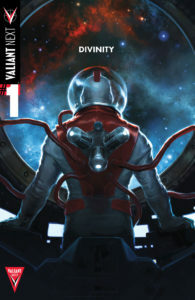 One of the most interesting comics that I’ve read over the past few years, Divinity is a longer tale broken up into three parts. Each part is a separate trade, and I dare you to pick up the first part of the story without reading the rest. It’s also a title that my students digest quickly. I rarely have a student read book one and not ask for the rest of the story. So, what’s this Divinity about? During the Great Space Race, Russia sent up three cosmonauts to explore the ends of the universe, and in a strange turn of events, one of the cosmonauts comes back to Earth with the powers of a God. I will leave most of the story elements of Divinity a secret because this book delivers in keeping the reader thinking and sometimes confused…in a good way. This book is not for the non-thinker. The book not only forces you to contemplate what is going on on the pages, but it also asks you to contemplate your own life and decisions on this planet. The art is great, and the creative team does some amazingly interesting things with page/panel layouts. Unlike some of the books that I’ve described as great for novice comics readers, this one should be enjoyed by comic veterans; a first time comic reader might get a bit lost in the complex layout. As I’ve said before, the only criticism that I have with this book is the inclusion of many characters from the Valiant Universe. Valiant does a great job inter-locking their brand and titles, but for someone not familiar with the Universe, they may get a little confused. I don’t think it pulls the reader too far out of the story; for many of my students that read this book as their first Valiant title, they may ask a question or two as the heroes of the Universe attempt to stop Divinity, but they usually get that these are the “good guys” of the world showing up to help in a moment of uncertainty. If you are into Sci-Fi and super heroes and like your stories more complex than Guardians of the Galaxy (which I also love but is more of a popcorn read than this), start with the first trade, but put the second one on hold at the store. My guess is that you will be back for the second one soon, for while the art is great, the writing and story will have you wanting more. Happy Valiant Comics Week! Happy reading!